I had wanted to try Ro's Argan Body Conditioner for a long, long time. I absolutely adore the scent, which is the same scent of my favourite shower gel and bubbleroon, Rose Jam. I'm also a big fan of the African Paradise Body Conditioner, so I knew I would love the benefits of the product itself, but I wanted to try it for myself to see if it really was as good as everyone else says. It's easily one of the most talked about Lush products I've come across, especially from some of my favourite American beauty gurus. If you're new to Lush body conditioners, they're very simple to use. 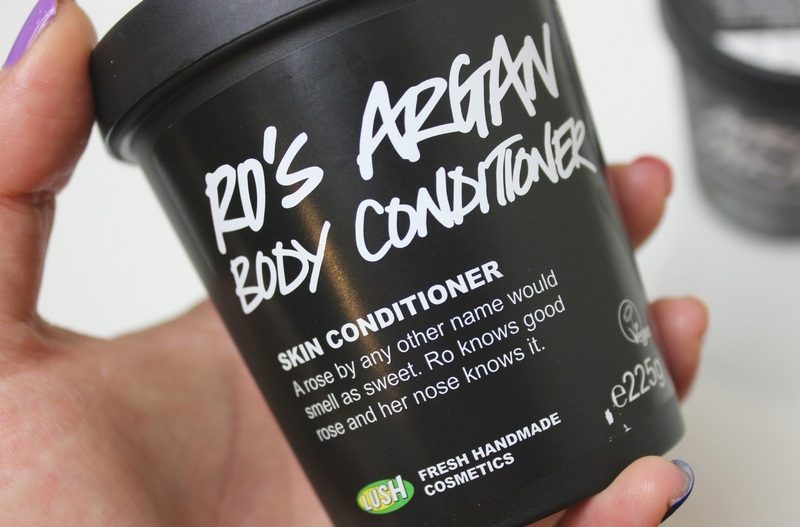 I find them easiest to get on with in the shower opposed to the bath, where I'll slathered it all over after I've done a full body scrub, shaved, washed, hair done - whack on the deliciously creamy Ro's Argan and leave on for 5-10 minutes. That might sound like a long time, but I find if I apply a hair mask in that time and give myself a scalp massage, it goes much quicker than you'd think. When I'm ready, I simply rinse off. It leaves quite an oily residue on the skin and it's not the kind of product where you wash off completely; it'd take some scrubbing to get the residue off! That's the point of Lush body conditioners though, it saves you time on moisturising and applying your lotions and potions after your shower, you simply pat in any residue and your skin is left deeply moisturised and beautifully soft. How? Well it's packed with skin plumping, moisturising and conditioning ingredients, such as Argan Oil, Vitamin E, Brazil Nut, Almond Oils, Cocoa, Shea and Cupuacu Butters. It's like a super moisturiser in a pot with a delicious rose scent, lovely. It's not the cheapest Lush product, coming in at £16.50 for a 225g tub or £27.95 for a 500g tub, but they last forever and you can easily get away with using it once a fortnight, which is how often I use mine. Have you tried any of the Lush body conditioners before? I haven't heard of these from Lush before, they sound really interesting!